As I mentioned in traveling on or off the beaten path, I don’t shy away from a line if the end justifies the means. Some travelers see a line and quickly turn around not wanting to waste their time. 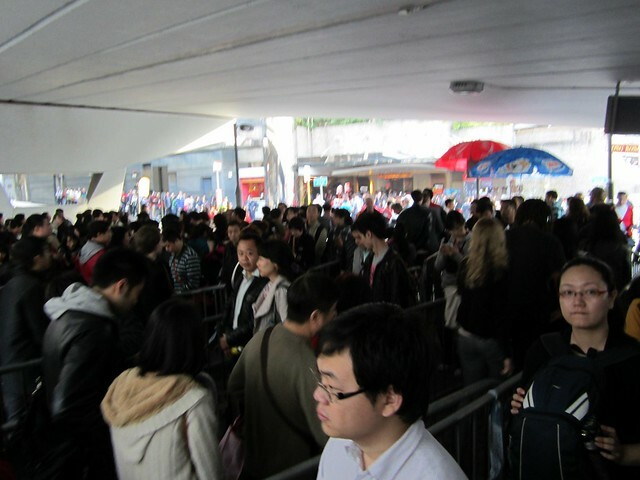 When visiting Victoria Peak yesterday, I got in line. Yes, I felt a bit like I was in Disney World being herded back and forth like cattle in a predetermined line. I will say the Chinese are organized and quick. They had police out there ensuring everything ran smoothly, and considering the length of the line the 45 min wait wasn’t too painful. Well, the 45 min line was to wait in line to get your ticket (you can also pay via Octopus card), and then you are directed to another line in order to wait for the tram to take you to the top. Like at the Big Buddha, there are two options to get to the top. You can opt for the bus and take a longer, more nauseating drive up the peak, or you can take the tram. The price to get to the top and back wasn’t bad at $40 HKD ($5.15 USD) and for convenience we took the tram both ways. Once you cram on the tram with as many people as possible, you begin your ascent up at an improbable angle. Most likely you will be unable to see anything depending on your seat and how many others are trying to see out the same window. I suggest sitting back and enjoying the ride. The tram drops you off in a huge mall (people in Hong Kong do love to shop!). Once again you are given options. The Sky Terrace viewing area is the highest point you can get to see the fabulous view of the skyline. 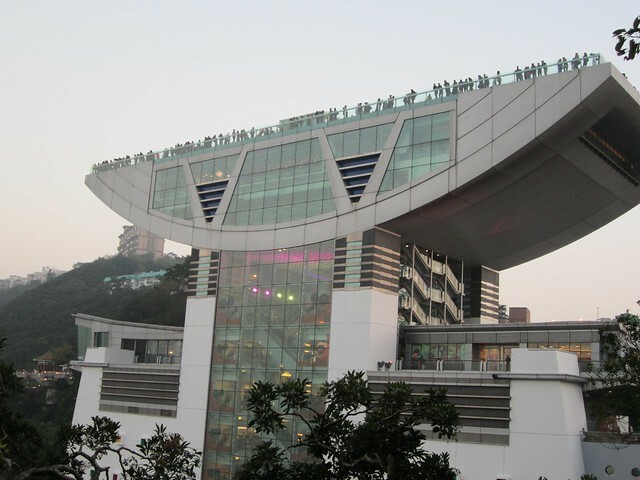 We didn’t pay to see the skyterrace viewing area for an additional $28 HKD, but walked down the path outside. The walk is 20 minutes to multiple viewing points. Don’t stop too early as the views get better the further out! We didn’t have time to run back and get our DSLR camera so these photos are just taken with my point and shoot. The Peak is an excellent example of why you simply can’t just look at photos from a place to truly get the experience. Standing on the top of the city, viewing the massive number of buildings and seeing the colors and details on each structure is amazing. The photos don’t do it justice. When you have walked around and gotten your fill of the view, walk back to the main tram area. There will be another line that you will wait in to get back down the peak, so make sure you use the restroom and grab any food before you wait another 30-40 minutes to get back down. Leave enough time to stand in line, there will be lots of waiting to get to the top and to take the tram down. Pick a clear day. The fog and pollution index can affect your viewing. Also, seeing the peak at night lit up and during the day are two different experiences so either plan two trips, or pick how you want to see the city! I am going to Hong Kong in August. I was wondering what is the best way to get to the Peak? I am staying at the Harbour Plaza North Point and I am so confused. Did you plan everything before you went or once you got there?